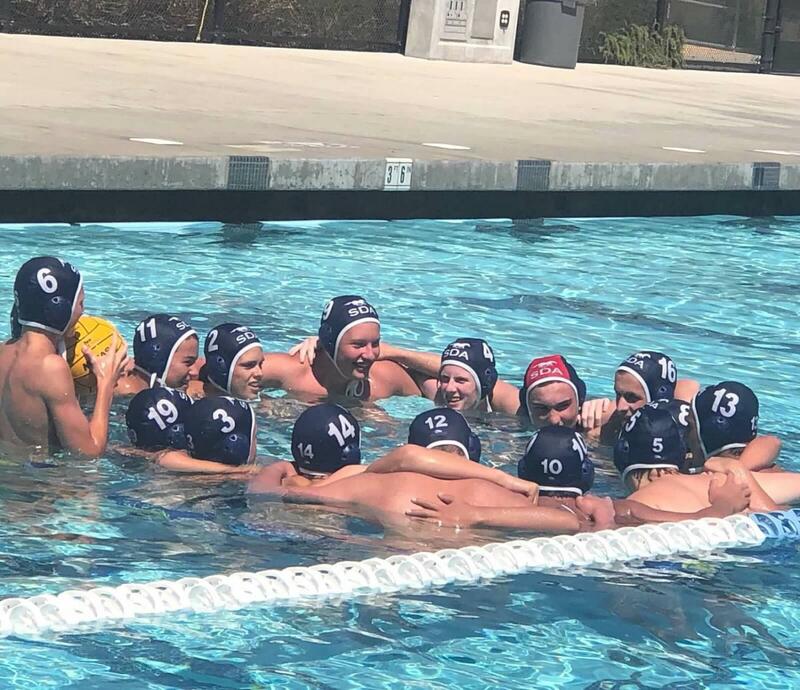 After a tough loss against Helix High School on Saturday, the SDA JV boy’s water polo team won their last two games at the Eagle Invite in El Cajon. In the first quarter, the Mustangs won the first sprint to kick off the early morning game. The first three minutes of the seventh quarter consisted of back and forth ball carrying by each team, with strong defense no goals were scored. Sophomore goalie Charlie Scholl saved a 5 meter penalty shot at the 3:45 minute mark. Attacking the goal, sophomore Alex Glenn was able to get a shot off. After sophomore Quinn Vickery was ejected, SDA held their ground in a 5 v 6 play. In the last 30 seconds, Helix scored a goal to end the quarter at 1-0. The second quarter came with higher intensity and a slew of ejections. Twenty seconds in, the Mustangs were playing 5 v 6 after an ejection, however, that didn’t stop the defense from keeping their shape and blocking shots. Another quarter of back and forth play resulted in ejections from both teams as the anticipation grew from the close game. The uproar from the crowd increased as Glenn shot twice and sophomore John Rathsom had two shots. Helix scored in the last two minutes of the quarter to end the half at 2-0. After switching up the team lineup completely, the Mustangs won the third swim off, and the fast-paced game play from both teams continued. Scholl had 3 saves and sophomore Vinny Wibbs attacked the Helix goal with fellow teammates to create opportunities. The game stayed at 2-0 to end the quarter. Losing the fourth quarter sprint didn’t stop the Mustangs from stealing the ball right back. Helix began the fourth quarter ejections at the four minute mark, but was able to score a quick goal a minute later followed by a complete rotation of Mustang players. With two minutes left of the game, Helix threw a quick shot that bounced off the left post, only to be pushed in half second later. Sophomore Will Beales had two shots towards the end of the quarter, followed by two 2-meter saves by Scholl. After a tough fight, the Mustangs lost to Helix 4-0, but that didn’t stop them in their later games. “I feel like I’ve been playing great. We are going to get this bread (the win) in the next games,” said Scholl. Winning 6-2 against Helix and 9-4 against Mar Vista, the Mustangs ended the tournament on a high note and getting the bread. Facing off to Escondido on September 17, the Mustangs plan on getting the win for their next home game.